Please help me to ID the plants and insects in these photos. I purchased this Plant at A+A Growers in Valrico FL. It was not labeled with a name and they didn't know what it was. I haven't included a full picture of the plant because it's been growing on my balcony, getting only early morning sun. As with most of my plants on the balcony, it's been reaching for sunlight for so long that it doesn't have a "normal" shape. I believe it will eventually bush out, maybe grow like my Pink Cestrum. It's about 4 feet tall and looks as though it will also get that wide. I did find this plant at the USF Botanical Gardens Spring Plant Sale last weekend listed as "Orange Justacia". 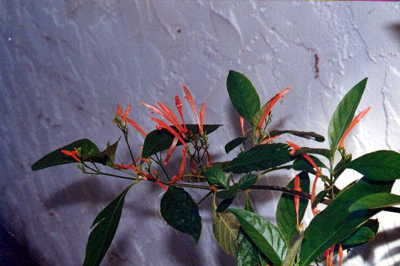 But, the vendor had a plant misidentified (at least by my knowledge of common names) and he had a Pink Salvia similar to the one below) that he didn't know either the species or common name. I'm waiting for hummers to come through (when I can watch this plant) to find out if it's a good hummer plant. Tasting of the nectar would indicate it may be a hummer plant. I purchased these Plants also at A+A Growers in Valrico FL. They were both listed as Greg's Salvia. 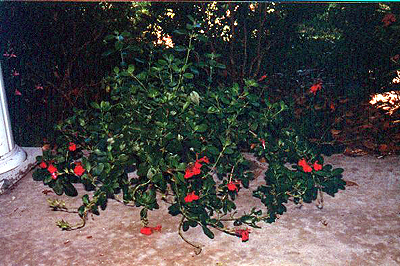 The pink one appears to grow more upright with longer narrower leaves, while the red one sprawls more and has shorter more rounded leaves. I suppose some of this may be due to growing conditions. The leaves of the red one are very aromatic. 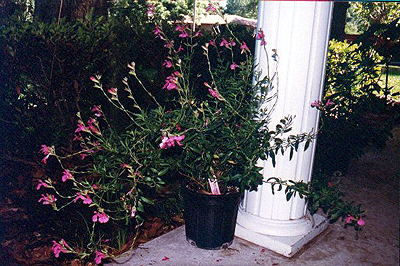 The pink salvias mentioned above grew straight up (no sprawling) and had the same long narrow leaves as mine. Again, I suppose some of this may have been due to the conditions they were grown under. These critters are growing on my Dwarf Powderpuff. I assume they are some form of a tree hopper. They start out as small versions of the bottom photo and then grow to full size, a quarter inch. They then change to the green varieties in the top photo, one with a point and one with a club. In both photos, the bottom insect is multi-colored and has a point. This is consistant with all of the groups (there are at least five on the plant now). Above each group, a small bloating of the stem appears to be the spent egg case. I'm not observing any damage to the plant above these colonies but I may be noticing some in other areas. This could also be due to a recent relocation and subsequent change in sunlight received. it is blooming better than it has been. Are these harmful? And, should I be removing them?